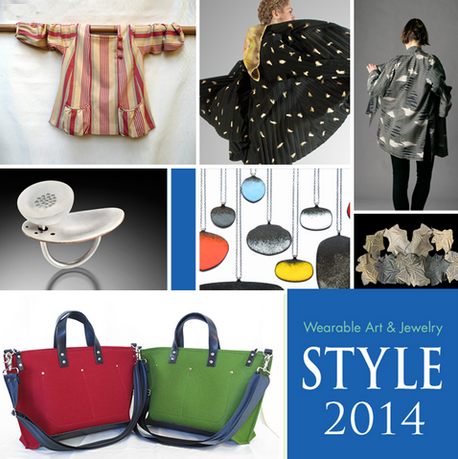 STYLE 2014 will be held this year at the Palo Alto Medical Foundation in Mountain View California, featuring a wide selection of handmade items by artists from all over the Bay Area(including our very own WSN Member Ana Lisa Hedstrom). Jewelry and textile designs of 45 locally and internationally renowned artists will be featured in an exclusive two-day show, sale and benefit. Come out and see one-of-a-kind and limited edition fashion wearables, accessories and jewelry. This event will be supporting the Palo Alto Medical Foundation Women’s Cancer Survivorship Program, which offers survivorship services for people coping with cancer. Saturday, April 26, 10:00 a.m.-5:00 p.m.
Sunday, April 27, 10:00 a.m. -3:00 p.m.
Saturday, April 26, 9:00 a.m. – 10:00 a.m. Ample free parking is available on site. » Click for map. This entry was posted on 25 April 2014 by World Shibori Network.